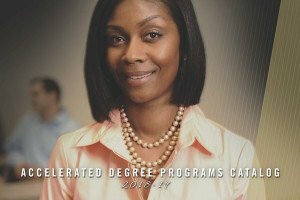 Why Lindenwood's Accelerated Degree Program? The School of Accelerated Degree Programs is an accelerated program in which students combine extensive self-directed study with a once-per-week class meeting earning nine semester hours of university credit in twelve weeks. The program serves to merge academic goals with practical knowledge applicable to the student’s workplace. The goal of the adult-centered program is to establish the habit of lifelong learning beyond degree completion. Upon entry, each student is assigned an academic advisor to guide the student to graduation. The student-advisor link remains critical throughout a student’s academic career. Therefore students are required to contact their faculty advisors on a quarterly basis. Central to the theory and practice of adult education is the ideal of the synthesis of knowledge. The School of Accelerated Degree Programs seeks to achieve this goal through the construct of the cluster. Clusters are comprised of a faculty member and approximately 12 to 14 students who meet for four hours weekly during an evening or weekend. Each student is enrolled in a group of three related subject area courses, called a cluster, that are, in many cases, integrated into one seminar. Three semester hours of credit are awarded for successful completion of each course in the cluster for a total of nine semester hours per cluster. Students pursuing a bachelor of science degree must enroll in a one-hour lab in conjunction with the science cluster. The cluster provides students with an opportunity to explore basic subject areas beyond the confines of a single discipline. These cluster group meetings provide a collegial environment in which students present their work and share their learning. A major objective of this format is the development of knowledge synthesis, so students can expect their learning to be measured in a variety of ways: written and oral presentation, class discussion, research papers, group projects, and traditional testing. However, as is true of most higher-education programs, each professor determines how students are to be assessed and graded; therefore, tests and quizzes may be used to supplement papers and presentations as assessments of student mastery. Due to the accelerated nature of the cluster (program), the rewriting of papers or the assigning of extra credit homework to improve a grade, or grades, is not permitted. Once students enroll in the School of Accelerated Degree Programs through the admissions office, an academic advisor is assigned. Students are required to meet in person with their advisor for enrollment in their second cluster in the program, as well as for enrollment in their final cluster in the program, which serves as their exit interview. During the remainder of their time in the program, students have the option to either (1) meet in person with their advisor for enrollment, or (2) contact their advisor by email or by telephone for enrollment. This contact must occur each quarter during the student’s appropriate registration week according to academic rank. During this advisor contact time, the advisor discusses degree and enrollment options and opens the student’s portal for online registration. The advisor may register the student or students may register themselves for classes through their student portal. Once the initial enrollment is completed, the academic advisor closes the student portal. If a student decides after the initial enrollment to make a schedule change or withdraw from classes, the student must contact the advisor again, who will open the student’s portal for the enrollment change. It is the responsibility of the student to schedule this contact time with the advisor and to complete the enrollment process each quarter. Requirements vary, but at least 54 semester hours in the major area are necessary for most degree programs, at least 50 percent of which (three clusters) must be taken at Lindenwood University. Some majors require prescribed areas of study to be covered. In other majors, requirements are more flexible and the program of study is developed by the student in consultation with the faculty advisor. Special topics courses/numbers, listed in the catalog, are designated for use as substitute classes for those who have taken, through transfer credit, one part of a nine-hour cluster. A special topics course may be taken only in conjunction with a cluster and is not used as a separate course or tutorial. Special topics numbered courses may not be used to extend the cluster for three extra hours beyond the nine-hour cluster; the student may not take a 12-hour cluster. In cases in which the student needs one more hour to graduate, the academic advisor may approve a student to enroll in a one credit hour special topics independent study along with a cluster. A special topics syllabus will outline the course requirements that will include advanced advanced level coursework. Successful completion of at least 120 semester hours. Successful completion of the general education requirements. Completion and approval of the capstone course. Completion of the last 24 semester hours of study within the Lindenwood University system. Forty-two semester hours of upper division courses, numbered 30000 or above. Completion of at least 40 percent of the courses required for the major within the Lindenwood University system. A minimum cumulative grade point average of 2.0 in all courses taken within the Lindenwood University system, as well as in the student’s major. View the current School of Accelerated Degree Programs Catalog for more information about our undergraduate and graduate degree program offerings.